In designing a network device, you make dozens of decisions that affect the speed with which it will perform—sometimes for better, but sometimes for worse. Network Algorithmics provides a complete, coherent methodology for maximizing speed while meeting your other design goals. Author George Varghese begins by laying out the implementation bottlenecks that are most often encountered at four disparate levels of implementation: protocol, OS, hardware, and architecture. He then derives 15 solid principles—ranging from the commonly recognized to the groundbreaking—that are key to breaking these bottlenecks. The rest of the book is devoted to a systematic application of these principles to bottlenecks found specifically in endnodes, interconnect devices, and specialty functions such as security and measurement that can be located anywhere along the network. This immensely practical, clearly presented information will benefit anyone involved with network implementation, as well as students who have made this work their goal. 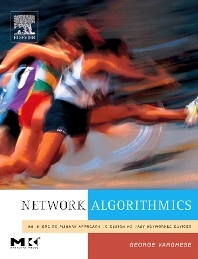 FOR INSTRUCTORS: To obtain access to the solutions manual for this title simply register on our textbook website (textbooks.elsevier.com)and request access to the Computer Science subject area. Once approved (usually within one business day) you will be able to access all of the instructor-only materials through the "Instructor Manual" link on this book's academic web page at textbooks.elsevier.com. Network protocol implementers, from server vendors (i.e., Sun, IBM, Microsoft) to router vendors (i.e., Cisco, Juniper, PMC Sierra, Redback, Alcatel, Intel Networks). Also appeals to designers of efficient Intrusion Detection Systems (IDS) and firewalls which includes implementers at companies such as Cisco, ISS, Raptor, Symantec, Checkpoint, Network Associates, as well as companies and startups in security, storage and networking. George Varghese is a widely recognized authority on the art of network protocol implementation. Currently a Principal Researcher and Partner at Microsoft Research, he has served as a professor in the Department of Computer Science at UC-San Diego, he has previously taught at Washington University and Stanford University. Elected a Fellow of the ACM in 2002, he holds (with colleagues) 22 patents in the general field of network algorithmics. Several algorithms that he helped develop have found their way into commercial systems, including Linux (timing wheels), the Cisco GSR (DRR), and MS Windows (IP lookups). Varghese has written more than 100 papers on networking, computer architecture, genomics, and databases.